Installing Richard Woods, Holiday Home at the Folkestone Triennial 2017. Image courtesy the artist. Chelsea Space presents Richard Woods: Second Home, an insight into the working practices of internationally renowned artist, Richard Woods. Woods practice of architectural, design and material interventions with graphic line and vibrant colour provide striking interruptions within a designated environment. This exhibition explores this practice through preparatory maquettes and drawings for the finished installation Holiday Home at the Folkestone Triennial 2017. Identical in size and design, Holiday Home comprised of six ‘cartoon bungalows’, set down in Folkestone where you may not have expected to find a house - in the harbour, on a traffic roundabout, sinking into the pebbles on the beach. 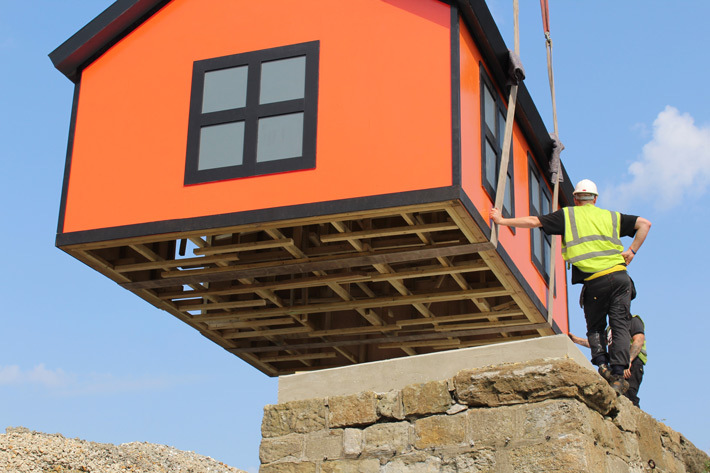 Containing new sculptures, paintings and photography, this exhibition includes material charting the fabrication, installation and public reaction to Holiday Home exhibited at the 2017 Folkestone Triennial. The material exhibited in Second Home will provide a contemporary retrospective on the recent project, reinforcing some of the issues that Holiday Home activated, while creating ongoing discussion around this project and interpretations of public art in general. British artist Richard Woods graduated from the Slade School of Fine Art in 1990. His architectural interventions are chiefly concerned with the re-surfacing of existing structures, and they propose an absurd twist on the cult of home improvement and DIY aesthetics. Selected exhibitions and projects: ‘Holiday Home’, Folkestone Triennial, Folkestone (2017); ‘Building Landscapes’, David Risley Gallery, Denmark (2017); ‘Duckweave’, Eastside Projects, Birmingham (2016); Festival of Love, Southbank Centre, London (2015); ‘Inclosure Acts, Chapter Arts Centre, Cardiff (2015); ‘Country Life’, Albion Barn, Oxford (2015); ‘Post Pop: East meets West’, Saatchi Gallery, London (2014); Richard Woods, Alan Cristea Gallery, London (2013); Frieze Sculpture Park, London, (2013); ‘WRONGWOODS’, Victoria and Albert Museum, London (2009); designed interior, Comme des Garçons’ flagship store, Osaka (2003); The Henry Moore Foundation Contemporary Projects, 50th International Venice Biennale, Venice, Italy (2002); ‘Super Tudor’, Deitch Gallery, New York (2002). Richard Woods lives and works in London.